Yugi and his friends’ story may have ended a decade ago, but there is still one last chapter to be told in the new animated film Yu-Gi-Oh! The Dark Side of Dimensions. Back in my early college days, it’s safe to say I was into Yu-Gi-Oh! I had the cards, played in tournaments, and even bought the entire first series of the anime on poorly translated bootleg DVDs from Hong Kong. But when GX started and the characters changed, I moved on. But moving on way back then doesn’t mean I’d pass up the nostalgic blast of seeing the old crew in one last adventure. 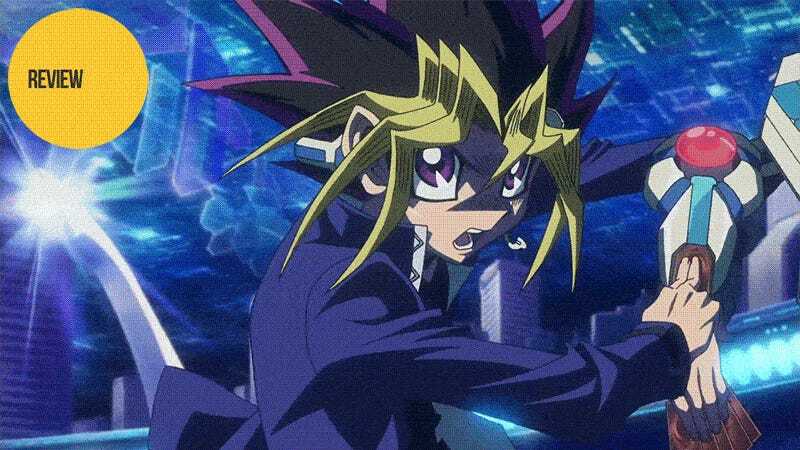 The Dark Side of Dimensions is set around six months after the end of the original Yu-Gi-Oh! with our heroes preparing for graduation. Each has a plan for the future, whether it be Yugi’s dream to invent his own card game or Tea’s plan to study abroad as soon as graduation’s over. But before the group is able to truly focus on the future, they must first tie up the lingering threads of the past. The plot of The Dark Side of Dimensions is centered around a group of orphans who were taken in by Shadi, the then holder of the Millennium Key. After his death, they moved to another dimension. But now, one of them, called “Aigami,” seems set on leaving, and with his own millennium item, getting revenge on those who wronged him and his. Another possibility is the spirit hidden within the Millennium Ring. After all, it is the reason the Shadi was killed, and it is eager to possess anyone it can in the course of its malevolent goals. But as the film goes on, the main contender for the film’s villain seems to be Seto Kaiba. On a personal level, The Dark Side of Dimensions is really more Kaiba’s story than Yugi’s. While the heroes are looking toward the future, Kaiba is trapped in the past. Kaiba is a creature of ego to a ridiculous degree. In this film alone, he creates a new duel disk capable of nullifying the power of millennium items, builds a space elevator and space station for seemingly no other purpose than to have a place to stash the millennium puzzle, stands in the middle of a busy intersection during a rain storm to challenge Yugi to a duel before flying away on a helicopter, and creates a hologram system complete with pseudo-AI just so he can try to play the Pharaoh in a children’s card game. Simply put, Kaiba’s ego and insecurity at being bested by the Pharaoh have clashed to such a degree that rectifying his loss has become his one driving obsession. He cares nothing if people die for his crusade—which, let me assure you, they do—nor does he care about the consequences to the world should the millennium puzzle be dug up and rebuilt. What’s interesting is that Yugi himself is almost completely ignored by Kaiba. All Kaiba wants is to face the Pharaoh. At most, in Kaiba’s mind, Yugi is the Pharaoh’s former vessel (and possibly future one). But as a duelist, Kaiba doesn’t even see Yugi as on the same level, despite Yugi proving his strength in his final one-on-one duel with the Pharaoh. All in all, it’s an interesting (read: somewhat terrifying) look at how Kaiba deals with loss when a rematch seems all but impossible. The rest of the original cast pops in and out of the story at steady intervals. Tea continues the role of supporting friend. Joey and Tristan act as comic relief. Only Bakura really gets any kind of development as we (and he) get to witness his first meeting with the Millennium Ring and all that that event sets in motion. But what would Yu-Gi-Oh! be without card battles. There are four main ones over the course of the film, and they seem insanely fast-paced for anyone who has watched the series. The duels last a few turns at most and totally disregard any semblance of rules as the contenders seem to have limitless hands and go whenever they feel like it. But you do get to see pretty much every variation of the Blue Eyes White Dragon. So at least there is that. The Dark Side of Dimensions was a deeper film than I thought it would be. Instead of the crew fighting a new and largely unrelated one-off villain, we watch as the characters old and new deal with the immediate fallout and lasting consequences of the series. Moreover, focusing on Kaiba’s obsession gives the story real weight, making it feel like a necessary part of the overall narrative and not simply a throwaway piece of filler. Or to put it another way, even a decade later, it’s still time to duel. Yu-Gi-Oh! The Dark Side of Dimensions was released in Japanese theaters on April 23, 2016. It is scheduled for a Western release sometime in later 2016.